I've been participating in What My Child is Reading at Mouse Grows Mouse Learns for quite some time now on my other blog, Just Playin' Around. But I've decided to consolidate all of my book reviews, including reviews of children's books, on My Book Retreat from now on. So each Saturday, I'll be sharing what my children -- C (5 1/2) and M (2 1/2) -- have been reading during the week. This week I pulled out some of the Christmas books we have on our bookshelves around our house. 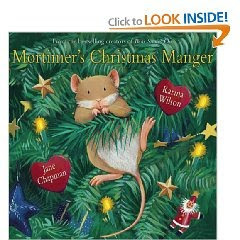 One of my favorites to read to my kids is Mortimer's Christmas Manger by Karma Wilson and Jane Chapman. This is the story of Mortimer, a little mouse who lives in a small, dark hole in a big house. One day he spies a little house just his size, but there are several statues in it. So he moves them all out, including the baby laying in a small wooden manger, and climbs in to sleep himself. He returns each night to sleep in the manger, until one night when he hears the story of Christmas and realizes the baby is the one who really belongs in the manger. It's a sweet story with appealing, colorful pictures. It's a bit too wordy for M. She loses interest in the middle, but then gets back into it at the end. C loves this book and had us reading it to him just about every night last December. 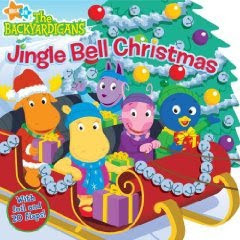 One of the kids' favorites is Jingle Bell Christmas (The Backyardigans) by Catherine Lukas. This one is very different than the last one. It's not about Jesus, but rather about the gift-giving aspect of Christmas. Each page features a Backyardigans character who is on his or her way to the Secret Santa tree. There are flaps to open, revealing the gifts they're bringing as well as many other surprises. And the book is filled with foil accents which make it shimmer. The words are actually in the rhythm of Jingle Bells, so you can sing the words if you're so inclined. As I mentioned, both of my kids enjoy this book and it's a nice story about exchanging gifts with friends at Christmas. 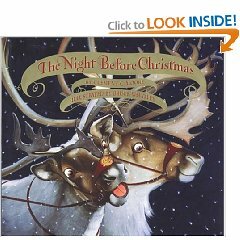 Last year, I decided to get the kids a book with the classic Twas the Night Before Christmas story. But with their ages, I thought a board book would be best. I ended up getting The Night Before Christmas Board Book by Clement C. Moore, illustrated by Bruce Whatley. The story is the classic poem that I wanted my kids to learn, and they love it. The illustrations are just okay. The pictures focus very much on the father of the family who leaps out of bed and encounters Santa by the fireplace. Here we see an old picture of the father who obviously wanted to be a cowboy as a child. And then Santa gives him a small cowboy toy. It's sweet, but I think I will replace this with a different version when the kids are both old enough to trust them not to tear the pages! The other Christmas book that M has been enjoying is an old one, so you might have to find it at a used bookstore if you're interested. It's called A Stable in Bethlehem: A Christmas Counting Story. The story starts with 12 doves cooing over a stable in Bethlehem, and proceeds through the animals, shepherds, angels and wisemen, to 2 parents and 1 baby in the manger. It's a great counting book with a Christmas theme. M especially loves the animals and the baby Jesus at the end. M likes the Backyardigans so I'll have to look for that one. We also like the Christmas counting book you mentioned! Thanks for sharing! Wonderful books! I want to go check out Mortimer's Christmas Manger--we love Wilson & Chapman's Bear Snores On. Thanks for linking to me! You have so many good ideas. The first book sounds very interesting - I'll see if our library has it. I just bought MOrtimer's Christmas Manger, and am EAGERLY looking forward to reading it to the kids. I'll have to see if I can track down a copy of hte Christmas counting book. Ticia, I hope your kids love it as much as mine do!